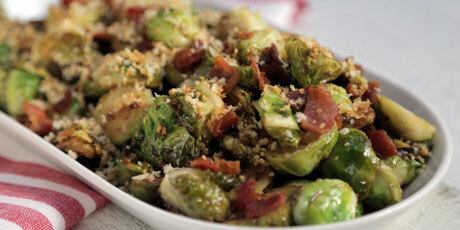 The ultimate brussels sprouts are loaded with the ultimate Canadian ingredients in this festive holiday side. Even sprout avoiders will have a hard time resisting these. 2. In a small bowl, combine beer, mustard, maple syrup and salt. 3. On a large cast iron pan or high-sided skillet over medium heat, cook bacon until crisp, about 5 minutes. Transfer to a plate. 4. In the same pan or skillet over medium heat, sear sprouts cut side-down until golden brown on the bottom, about 5 minutes. Stir in prepared beer mixture and bacon. Transfer skillet to the oven and roast until sprouts are tender and liquid has reduced, about 10 minutes. 5. Meanwhile, in a skillet over medium heat, melt bacon fat or butter. Stir in panko and toast until golden brown, about 2 minutes. 6. Transfer sprouts to a large serving platter or bowl and sprinkle with toasted panko. Serve.